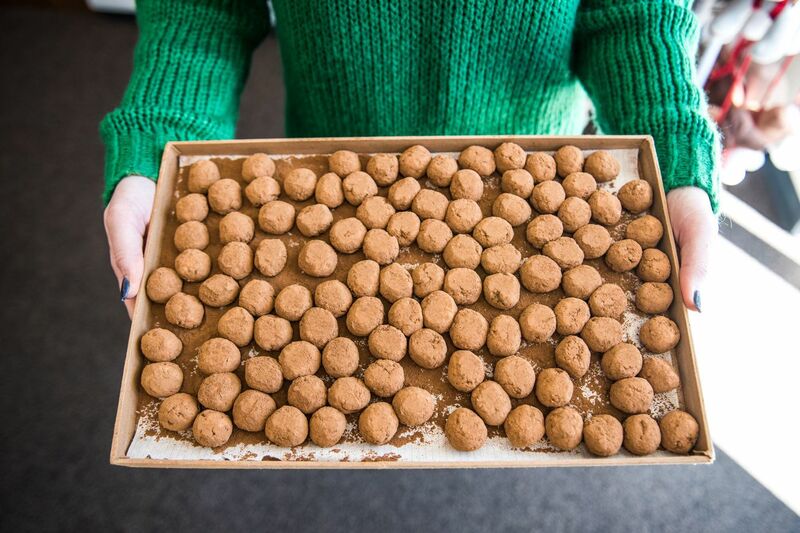 A more-than-century-old Philadelphia tradition, Irish potatoes can be found across the region in the weeks leading up to St. Patrick's Day. The seasonal candy features a sweet, coconut-cream filling that gets rolled in cinnamon. Halloween and Valentine’s Day are great, but for St. Patrick’s Day, Philadelphia gets its own candy. In the spirit of what feels like a weeks-long holiday in these parts, we’re diving into the magic that is Irish potato candy this morning. Prepare for a sugar craving. Also returning to the City of Brotherly Love? Wide receiver DeSean Jackson, apparently. We’ve got updates on the Eagles’ latest moves — and there are plenty. Coconut. Sugar. Cinnamon. A few simple ingredients make up the Philadelphia tradition of Irish potatoes. The origins of the candy, sold in the lead up to St. Patrick’s Day, are vague, though it’s more than a century old. But that hasn’t stopped the region from buying them up each year, or local candy makers from churning them out the old fashioned way. Wide receiver DeSean Jackson will soon come back to Philly, five years after his unceremonious release from the team. The Eagles will trade a 2019 sixth-round pick to Tampa Bay in return, and get back a 2020 seventh-round pick. The Birds have also signed defensive tackle Malik Jackson to a three-year deal, signed left tackle Jason Peters to a one-year deal, and tendered a one-year contract to backup QB Nate Sudfeld. One Bird who’s flying south for ... ever? Super Bowl MVP Nick Foles, who will sign a four-year, $88 million contract with the Jacksonville Jaguars. Tuesday is petition day in Philadelphia. By 5 p.m., candidates for the city’s May 21 primary must file their nomination petitions with the Board of Elections. It’s shaping to be an especially competitive election with crowded contests for mayor and City Council. At least one mayoral candidate, Republican Daphne Goggins, has already dropped out. Typically ballot challenge season starts just after the petition deadline, but this year politicians got an early start in trying to knock their opponents off in court thanks to two judges-turned-inmates running for office. The officer who shot a 25-year-old Ethiopian immigrant Wednesday in West Philadelphia was identified by Philadelphia police Monday. The victim had been the one to call 911 last week, his boss says. Pennsylvania will launch an investigation into child abuse and lawbreaking at the Glen Mills Schools in response to an Inquirer investigation, officials announced Monday. President Donald Trump proposed a $4.7 trillion budget plan Monday that includes $8.6 billion more for a border wall, raising the possibility of another fight with Congress. Stephen Klasko thinks sleep is overrated. The president and CEO of Jefferson Health only sleeps four or five hours a night. But are so-called “short sleepers” risking their health? The answer is complicated. Buying a lot of your favorite goods online? You could end up with a sales tax notice in the mail if you live in New Jersey or Pennsylvania. The Flyers climbed to within three points of an Eastern Conference playoff spot with a 3-2 win over the Ottawa Senators Monday night. The surge continues. Self-taught Havertown baker Dan Langan’s journey from his modest home kitchen to the Food Network is a fondant-filled dream. Netflix is adapting Gabriel García Márquez’s novel One Hundred Years of Solitude and let’s just say Philly professors are ... skeptical. Cheers, ladies: Philadelphia is getting its first female-focused beer festival this spring and tickets are already on sale. Now that this year’s Flower Show is over, one reader wants to know, what happens to all those blooms? Meditation can strengthen and recharge your mind. With just a few simple steps you can master the practice. “How do you insult a beer? You call it watery or say it tastes like water. But at the end of the day, our beers are 90 percent made of water, so we heavily rely on access to a plentiful source." — Flying Fish Brewing Co. Gene Muller on why he is committed to protecting the Delaware River watershed. Teens are riddled with anxiety about their futures. We can help by not stressing them out with career choice pressure, writes psychologist Janet Sasson Edgette. After reading about the Fitler Club’s goal of a 40 percent female and 15 percent “diverse” membership, lawyer and consultant Kirkland Alexander Lynch writes that the social club should strive to accurately represent Philadelphia. You’ve never been dedicated to anything like the recently-married couple who’s long-distance high school relationship took them from Tokyo and Shanghai to Thailand, Australia, New Zealand, and finally, Philly. The New York Times made a map explaining it all. Right now a volleyball team from a small Pennsylvania community is headed to Abu Dhabi to compete in the Special Olympics World Games, and WHYY has the details on their inspiring journey. The story of a group of women fighting to keep their shelter open highlights the shifting demographics of Philly’s homeless population, reports Philadelphia Weekly. Pedestrian fatalities are on the rise in the United States, so City Lab dug into the concerning trend to find out where the traffic safety divide stems from. In a look at the divided state of America, the Guardian has talked to liberal white women in conservative southern communities who describe abuse, rejection, and humiliation for their views. The Philadelphia Museum of Art recently had a bright idea: to replace 11,000 lightbulbs and fixtures in its buildings with new lights that will better serve its treasures.